For this week’s colorists spotlight series I’m introducing Cindy Nation from Australia and her impressive coloring skills! 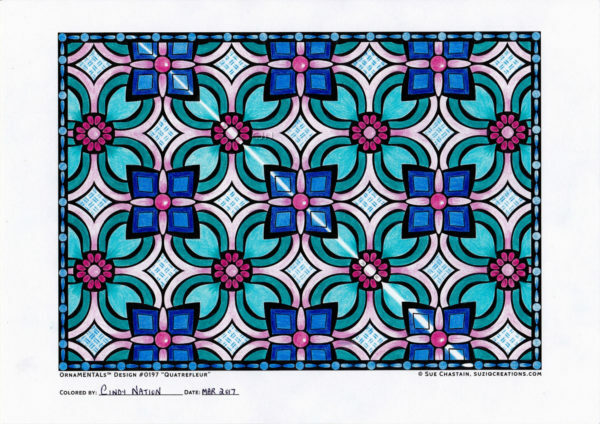 Read on to learn more about Cindy and how experimentation through coloring gives her a sense of accomplishment. 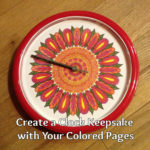 Through Cindy’s story, I hope you discover new techniques, artists, books, tips, and ideas for coloring. When did you get into coloring and what were the circumstances that led you to it? I started coloring in October 2015. Local stores started stocking more coloring books and I was impressed with the variety of designs available. I have always loved color, as I used to do cross stitch and stitching with color was so enjoyable. I thought I would give coloring with pencils a try and still enjoy bringing a picture to life with color. Why do you color? What are the benefits of coloring for you? I love the stress relief and relaxation I experience while coloring. It’s nice to just have some “me time”, where I can “chill out” and feel a sense of accomplishment from coloring a piece of art. 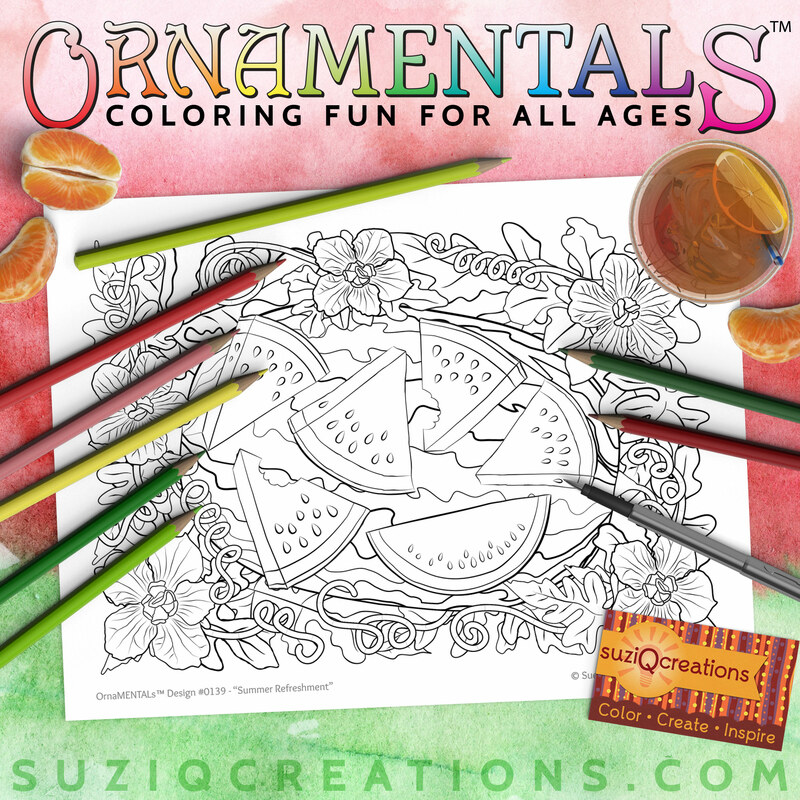 What are your favorite media to color with? 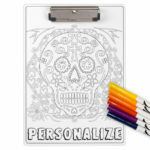 Do you have a particular favorite type or brand or coloring tools? I love pencils! My favourites are Faber Castell Polychromos and Marco Renoir. Both brands offer great pigment and blend easily for good effect. Whilst the Polychromos are a more expensive brand, I really love the Marco Renoir because they don’t cost as much but the results are still brilliant. From Maria Castro’s Day & Night Garden Mandalas Vol. 2 colored by Cindy Nation. 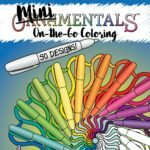 What are the top 3 coloring tools you would not want to be without? I wouldn’t be without my colored pencils, my Faber Castell sharpener and my Faber Castell eraser! 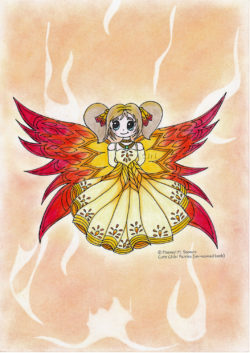 What are some of your favorite coloring books, artists, and styles of coloring art? Some of my favourite coloring books include: OrnaMENTALs Feel Good Words by Sue Chastain, OrnaMENTALs Lights Out by Sue Chastain, Color My Moods Garden Mandalas by Maria Castro, Color My Moods Healthy Hue by Maria Castro, Minidalas by Moomal M. Soomro, Relaxation Plan by Moomal M. Soomro and Glamourista by Jennifer Zimmermann. Favourite artists include Sue Chastain, Maria Castro, Moomal M. Soomro, Christine Aldridge, Jennifer Zimmermann, Ligia Ortega, Karen Lukens, Jenny Gollan, Sarah Renae Clark and Lesley Smitheringale. 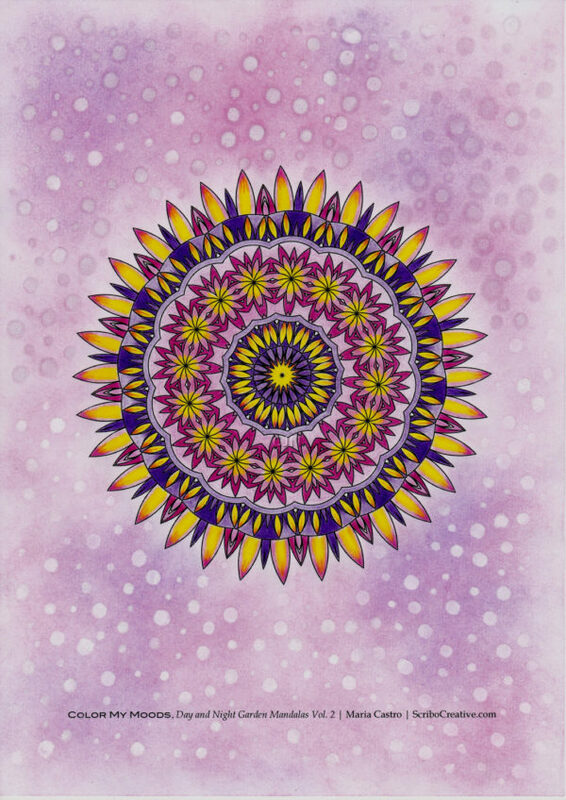 Some of my favourite styles of coloring art include mandalas and designs that include positive affirmations. What do you look for when choosing a book or piece to color? A unique design that appeals to me at the time. For example, a mandala that offers some intricate areas to color plus allows me to perhaps add some texture, stippling or a background. I like to be challenged and prefer designs that are more intricate or that have quite a lot going on in the design! “QuatreFleur” colored by Cindy Nation using a texture plate. 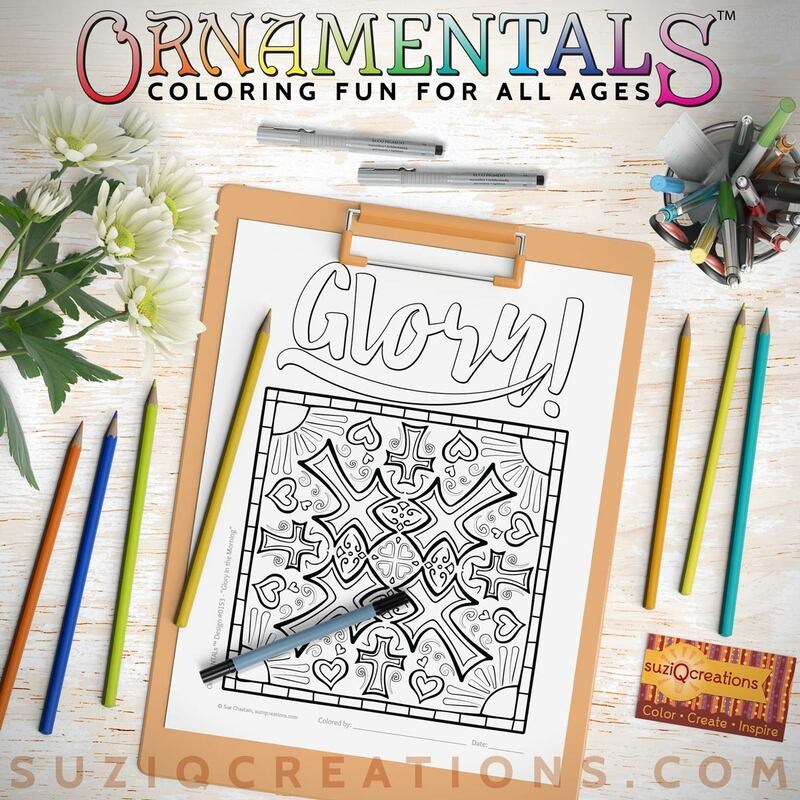 What’s your favorite place to color? 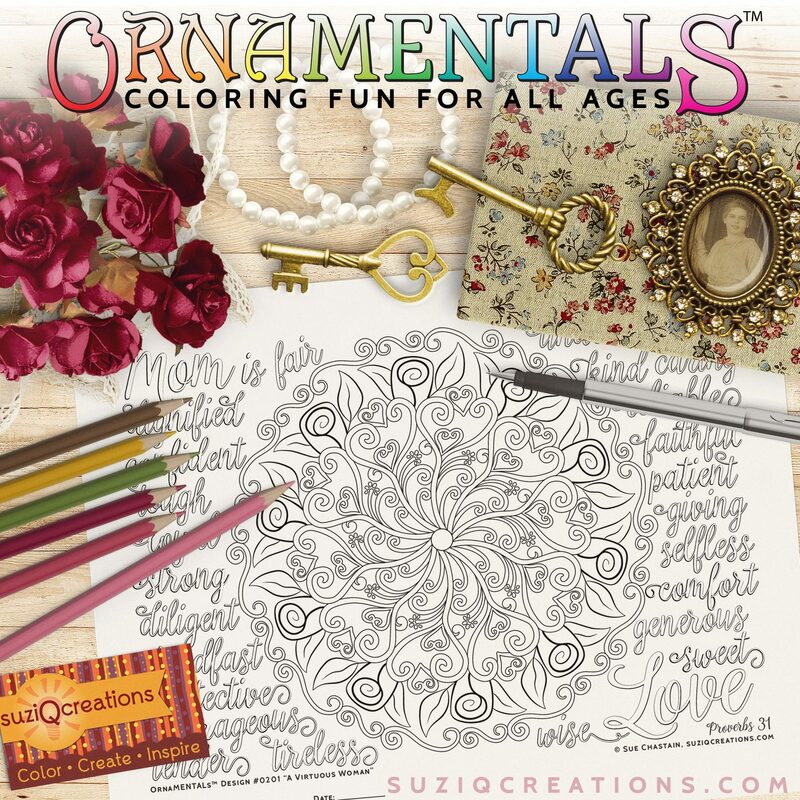 Do you have any coloring rituals? My favourite place to color is at home where I can enjoy peace and quiet. I have a desk set up which allows me room to have my design and pencils close at hand. I love to color every day if I can. This isn’t always possible but I try and squeeze in a bit of time each day, if I’m able to. Sometimes I just like to be at peace with only my pencils. At other times, I like to have the radio or a favourite CD playing. I firstly look at the design in its entirety. Then I work out what colors to use: some of my favourites are blues, pink and purples but I try to challenge myself and perhaps stick to a color palette or colors that I don’t use a lot like brown, yellow and orange. 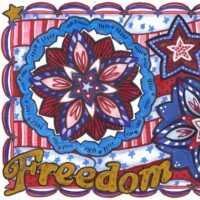 I also think about whether the design lends itself to a colored background, perhaps a section of texture using pointilism/stippling or use of an embossing folder/texture plate. I generally steer towards using colored pencils as you can shade/blend with them well, and erase the odd mistake! Working out how I’m going to color the design and what methods I’ll use, are half the fun for me! “Night Owl” from OrnaMENTALs Lights Out colored by Cindy Nation. 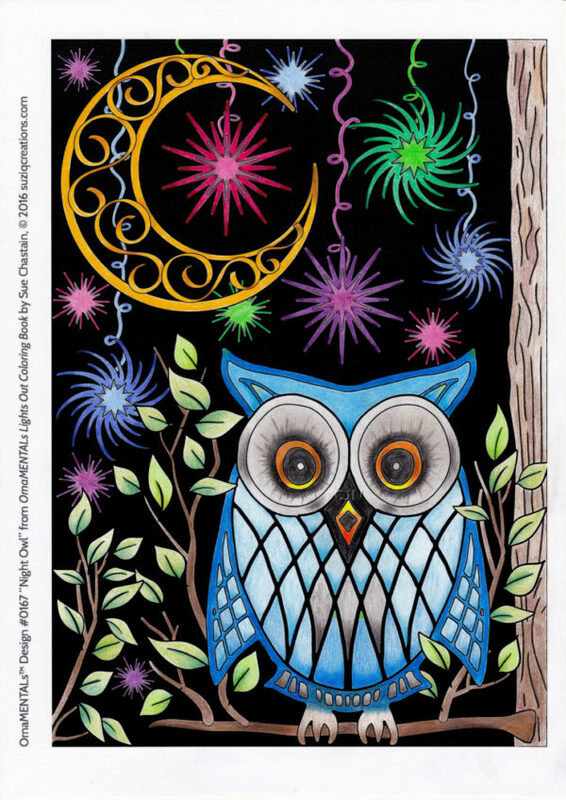 Do you do anything special with the pictures you color? How do you store them? I generally store my colored pictures in a display folder that is acid free. I know that kept in this environment, they will not yellow or break down over time. I always try to store my images flat. I recently gave a colored image to a relative suffering from cancer. It’s such a joy when you give a gift you’ve colored yourself to an appreciative person! Would you share a favorite color palette? 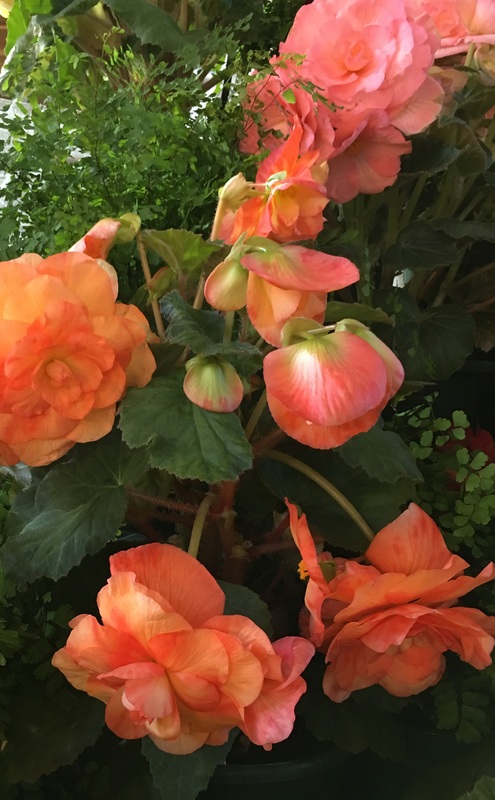 I took this photo at a flower show last year. It appeals to me so much because of the pinks, corals and green colors. Nature offers me such a wide variety of coloring inspiration! What tip or piece of advice would you give to someone just getting into coloring? Start simply and don’t expect too much of yourself! 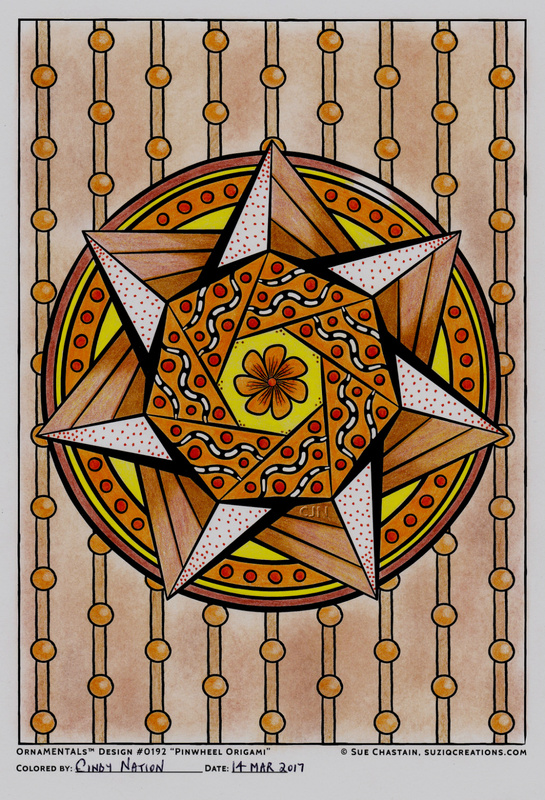 I suggest starting with a simple design, such as a mandala. Using your medium of choice, perhaps colored pencils as they can be erased if needed. Try not to compare your coloring with others you see! You can get ideas and inspiration from others but it’s important to enjoy the whole experience without worrying about your end result. What coloring groups, websites, or resources do you recommend? 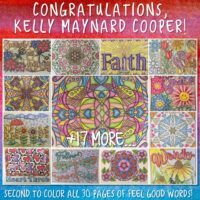 I am a member of quite a lot of coloring groups on Facebook but some of my favourites include: Color, Create, Inspire; The Cracked Crayon; Karen Lukens Artist – Coloring Group and Colour Me Crazy Australia. I also enjoy gaining ideas and inspiration on Facebook from: SuziQ Creations and OrnaMentals by Sue Chastain; Scribo Creative by Maria Castro; MomiArt by Moomal M. Soomro; Jenny Gollan Designs; Sarah Renae Clark; Ligia Ortega and C.L. Aldridge. 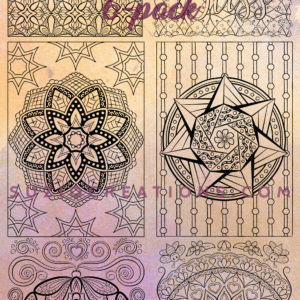 When I need some color palette inspiration I use design-seeds.com and enjoy visiting coloringpagesbliss.com for some great designs by Jennifer Stay. I sign up to artist email newsletters when I can and enjoy receiving updates from them and coloring inspiration and tips. Thank you for taking the time to answer this interview, Cindy! I’m a fan! Want to be featured in an upcoming colorist spotlight? Share your story! Extremely talented and creative colorist whom I have a pleasure in working with. She has been an inspiration to me as well as an advisor. It was an interesting and informative article and very enjoyable too. Such a well written article that really gives an overview of what colouring means to Cindy. The inclusion of the fabulous designs that have been coloured so beautifully, allows us to, not only gain inspiration for our own colouring, but also can lead us to the work of Artists that we were not aware of. Thank you Sue & Cindy! Thank you so much for your kind words Dorothy!